Jnana Yoga (The yoga of knowledge) is a book of Swami Vivekananda. based on a series of lectures on the topic delivered mainly in New York and London by Swami Vivekananda. These lectures were recorded by a professional stenographer J.J.Goodwin (who later became a disciple of Swami Vivekananda. Jnana means for "knowledge" in Sanskrit. The word is derived from the Sanskrit word Jna – to know; Jnana yoga is one of the types of yoga mentioned in Hindu philosophies. Jñāna in Sanskrit means "knowledge". In this book Swami Vivekananda has described "knowledge" is the ultimate goal. According to Swami Vivekananda freedom is the object of Jnana Yoga. ^ Chande, M.B. (2000). Indian philosophy in modern times. New Delhi: Atlantic Publishers and Distributors. pp. 212–213. 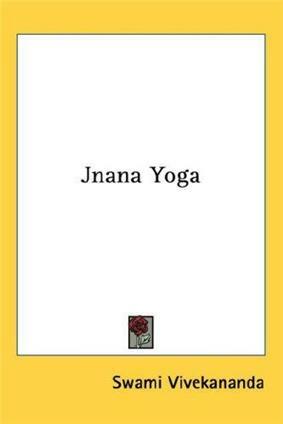 ^ "Jnana Yoga". http://www.vivekananda.net. Retrieved 21 April 2012. ^ Sen, Amiya P (2006). The indispensable vivekananda. India: Permananet Black. p. 228.